Genuine OEM Ricoh Toner Cartridge, Cyan, 29,000 page yield. Ricoh part number: Ricoh 841783, 842086. Color Laser Toner Cartridge compatible with Ricoh C5100S, MP C6502, MP C8002. Genuine OEM Ricoh Toner Cartridge, Magenta, 29,000 page yield. Ricoh part number: Ricoh 841782, 842085. Color Laser Toner Cartridge compatible with Ricoh C5100S, MP C6502, MP C8002. Genuine OEM Ricoh Toner Cartridge, Black, 48,500 page yield. Ricoh part number: Ricoh 841780, 842083. 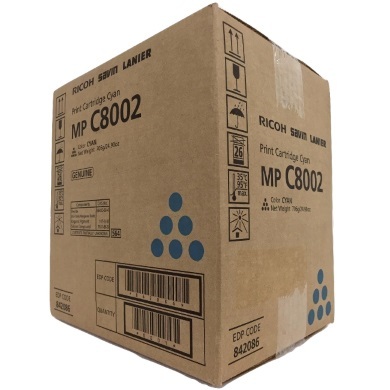 Laser Toner Cartridge compatible with Ricoh C5100S, MP C6502, MP C8002. Genuine OEM Ricoh Waste Toner Bottle,. Ricoh part number: Ricoh 416889. Waste Toner Bottle compatible with Ricoh C5100S, MP C6502, MP C8002.